We are designed to keep ourselves and others safe. Protection isn’t just about building walls, and keeping others out. On today’s show we learn how to recognize which fears are posing a true threat versus offering us a challenge. We’ll discuss the different types of heart centred protection methods that won’t drain your energy and compassion stores. Learn how to spot your comfort tree through the fear forest. Join us for a show that will shift you and lift your vibration setting you up for a confidant, hopeful, and loving journey. Top investments to “stock” up on and top expenses to avoid. The direct connection between you and your bank account. What’s draining and what’s gaining. Experiences versus physical objects and the value of both. How to do your emotional spread sheet. Incorporating company YOU and protecting company SELF. Discover the hidden and taboo beliefs healthy people carry. Explore the mindset of an immune champion who holds tightly his trophy of health in one hand yet barely keeps hold of comfort and peace in the other. From self judging to self defending, we will walk through the burden and choices of being healthy. the sick, the injured, the depleted mind that yearns or even fears having health this show is for ALL who desire joyful function of the physical ,mental and emotional self. Freedom from all pain bodies. On today’s show Lisa and Michelle share their mind blowing travel stories and how each adventure literally changed their lives. Taking this to the core level and owning the outcome, taking responsibility for their views on each sight that caught their eye. From expansion of self, to the nitty gritty slumming it style challenges, to mountain top beauty enlightenment’s you will be taken through a journey of shifts and make-overs that will have no other possibility than to change your state… of mind! 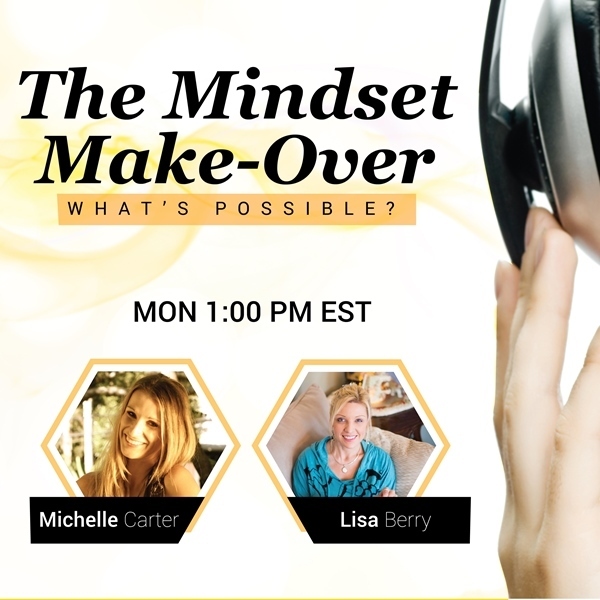 Join us this Monday for YOUR Mindset-Makeover- Be open to your possibilities! The Problem Before What’s Possible! What prevents people from seeing what’s possible? Fear, judgement, history, lack of information, lack of experience, not feeling safe. What are we willing to let go of to find a solution? Perhaps its letting go of disappointed after romanticizing of an idea. One important step after identifying the problem is not judging the problem. Never judge or compare your problem. Everyone has a different life. Find ways for you to personally feel safe to make a decision /choice. We encourage you to re-assess your goals to see if you are interests or committed ? Solutions sometimes appear AFTER making a decision as apse to when we are waffling. When we are committed to a goal choices are much easier. If haven’t yet identified what the problem is and are stuck in the symptom of the problem. It will be difficult to see any solution let alone going beyond it and better. Am I opening myself to change and challenges so that I can stretch and grow into my full potential?